A contract CIA operative is tasked with one more mission before being allowed to go see his wife and new born. An ex-operative has gone rogue after being disavowed and is now trying to set up a deal for a nuclear warhead. Given a team of operatives our hero goes to war against the bad guys in London in order to stop a potential nuclear incident. While the film slows down as it becomes needlessly messy in the second half (I'm not sure writer director Matthew Hope really thought out how to get from start to finish without having to add weird turns) the film always holds our attention thanks to some very good action set pieces and a dynamite first half. By the time things go sideways we are invested enough to want to see where it all goes. 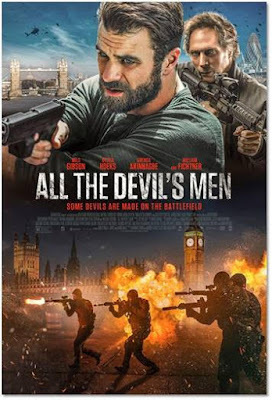 While never destined to be the next big action film ALL THE DEVIL'S MEN entertains in such away that is perfect viewing for a rainy afternoon. Currently available on Direct TV ALL THE DEVIL'S MEN hit theaters Friday December 7.